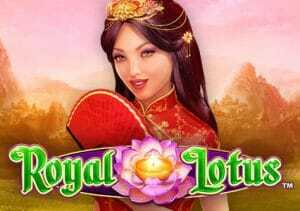 Royal Lotus is an Asian-themed video slot from Novomatic. Played using a 5 reel, 50 payline reel set, it’s a medium to high volatility game which is relatively simple. Fill the screen with the top paying princess and you’ll pocket 1,000 times your total bet. There’s also a Free Games feature that awards up to 15 free spins with extra wilds added to reels 2, 3, 4 and 5 on each spin. Play on the PC, tablet or mobile from between 50p and £100 per spin. There’s been a big improvement in the design of Novomatic video slots and Royal Lotus maintains the high standards. The action takes place on a set of purple reels that are backed by a misty valley. There you’ll find A to 9 royal symbols alongside fans, swords, treasure chests and money pouches. The best symbol is the smiling Asian princess. Land 2, 3, 4 or 5 of here in a single payline and you’ll receive a payout of 0.4, 0.8, 8 or 20 times your total bet. What you’ll really be hoping too is the princess to fill all 20 positions on the reels. In that happy event you can look forward to a bumper payday of 1,000 times your total bet. Helping your winning chance is the lotus flower. This wild replaces all other symbols apart from the golden dragon. When that golden dragon hits on reels 1, 2 and 3 on the same spin you’ll trigger the Free Games feature. After receiving an award of 4 times your bet, you’ll then go on to play 10 free spins. On each of those free spins, a wild lotus is added to reels 2, 3, 4 and 5. By the end of the feature, you should see plenty of extra wilds which can really get things moving. Landing 3 golden dragons adds another 5 free spins to your total too which can come in very handy with all those extra wilds. There’s nothing complicated about Royal Lotus. That’s the case with the design, which is simple but neat and tidy, and the gameplay which isn’t overloaded with extras. The Free Games feature has plenty of potential though thanks to the added wilds. The volatility is in the medium to high range. There’s no sign of the demand for Asian-themed video slots slowing down. With its tidy design and potentially exciting Free Games feature, Royal Lotus is a perfectly playable addition. I do prefer other Novomatic titles though with From Dusk Till Dawn and Dragon’s Deep my choices. T&Cs Apply New eligible UK players only. Select Casino offer on sign-up and deposit. 4 deposits of £10, £20, £50, £100 matched with a bonus cash offer of same value (14 day expiry). 35x real money cash wagering (within 30 days) on eligible games before bonus cash is credited. Spins credited upon deposits; under £50 =10 Spins, £50 or over =25 Spins; on Book of Dead only (3 day expiry, winnings paid in cash). Play Responsibly. 18+ begambleaware.org. Click for full T&C's.